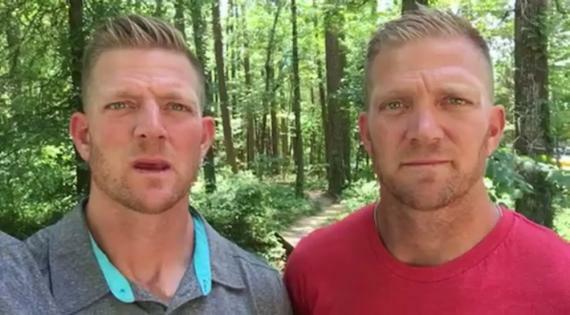 Thursday, Jason and David Benham have penned “3 Keys to Saving America From Collapse.” In their anti-LGBT diatribe the Benham brothers never get around to telling us what those three “keys” are but there is an over-supply of anti-LGBT hyperbole without directly mentioning LGBT people. These are two very angry people who aren't nearly as clever as they think. Moreover, those two posturing patriots are as un-American as the Taliban. So with grateful hearts, we celebrated the Fourth of July this year and are inspired to carry on the legacy of freedom for future generations—because July 4, 1776, didn't come easy, and it wasn't without cost. Although we don't face a despot leader today, we do face a despot agenda—an anti-American, anti-God, sexual revolution, which is just as formidable an enemy to freedom as any despot the world has ever known. In just 50 years, this revolution has gone from acceptance, to appreciation, to celebration, and now to forced participation as it demands absolute authority over any and every institution in our society. Keep in mind that not even acceptance of gay people is permissible according to the Benhams. “Celebration?” It is a favored claim of right-wing Christians. In point of fact, we do not care. We neither seek nor require their approval, let alone celebration. All we demand — all we have ever demanded — is Equal Protection and Due Process. As long as we are being patriotic, those are guaranteed by our Constitution. “Participation” remains undefined. Is selling flowers or baking a cake participation in something they disapprove of? Or, are they claiming it is participation in order to then claim that they have been victimized? Why are they so enamored of portraying themselves as victims of those who do not share their views? The radical agenda behind this revolution, fueled by the bullying tactics of the media thought mafia, has seized our school systems, secured our silver screens, penetrated our government and pierced our economy—and now it has captured our courts as unelected judges continue to redefine truth and undermine our freedom. Yes, yes, it is all part of a radical conspiracy to undermine Christians who love to be miserable. As for “truth,” that amounts to the religious views of the Benhams. They have a monopoly on wisdom and history. As long as we are there, let us remember that James Madison was very careful in the First Amendment to balance religious freedom with freedom from religion as demonstrated by the Establishment Clause. In fact this is clearly verified by the ruling in Obergefell v. Hodges. Our freedom to marry does not affect their Free Exercise of religion. Of course they will claim that nondiscrimination laws written long before Obergefell compromise their freedom (to discriminate) because a handful of wedding vendors want to discriminate on religious grounds. I will remind them that both slavery and segregation were defended on religious grounds. Putting God into the equation doesn't make it right. If they do not like the laws in Washington State or Colorado they are free to launch a ballot initiative or to elect legislators who will change the law. That is the American way and there are more of them than us. Complaining about laws while marginalizing a minority group is un-American. Suggesting that conservative Christianity is somehow our national religion is also un-American. They don't say it but that is precisely what they are doing. Most people do not share their views or their skewed values. While they are very good at self-promotion, the Benhams are lacking in intelligence and grossly lacking in curiosity. 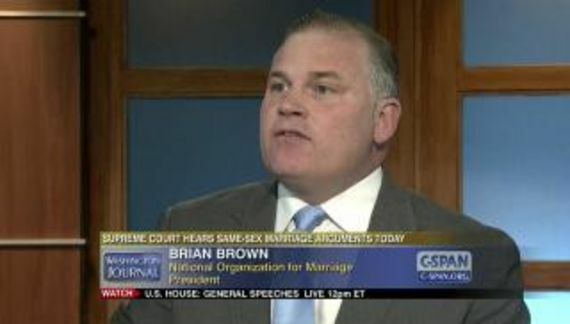 In his dissenting opinion on the Obergefell Supreme Court decision—the one that that legalized gay marriage—late-Justice Antonin Scalia ominously said, "This practice of constitutional revision by an unelected committee of nine, always accompanied (as it is today) by extravagant praise of liberty, robs the people of the most important liberty they asserted in the Declaration of Independence and won in the Revolution of 1776: the freedom to govern themselves." Scalia's was the losing argument. The Benahams seek to inflict their religious views on everyone else and that is impermissible. Apparently that freedom of self-governing doesn't apply to nondiscrimination laws because the Benhams disapprove of gay people. In the future we must consult Jason and David before every law passage and before any court ruling. Only they can provide the moral leadership that is so lacking. If their morality includes the denigration of minorities so they can be discriminated against then so be it. The Benhams are omniscient. Don't we all know that? Today, we still celebrate the freedom to govern ourselves every year on the Fourth of July, but it won't be long before we won't have that freedom if the radical sexual revolution continues unchecked. The freedom to govern ourselves works as long as the governing is approved by the Benhams. Otherwise they are victims of [fill in the blank]. Joseph Stalin once said: "America is like a healthy body, and its resistance is threefold: its patriotism, its morality and its spiritual life. If we can undermine these three areas, America will collapse from within." False. That quote cannot be found in any of a number of voluminous online libraries, according to Snopes. The oldest account of it, in a letter to the editor of the Lawrence Journal-World, comes from 1983 — three decades after Stalin died. As I said, the Benhams are not terribly curious folks. But even were that an accurate quote, our patriotism, morality and spiritual life have traditionally respected minority rights. We have been wrong in the past; sometimes for many years. Eventually, however, we have managed to get it right. Whether it was the Civil Rights Act of 1964 or the Supreme Court's decision in Loving or in Lawrence v. Texas (another Scalia dissent) Americans have cherished the notion of equality for all. Of course it is all subject to the approval of the Benhams. Stalin was right, and his prediction is happening right before our eyes. So it's time we return to our patriotism, our morality and our spiritual heritage that made this nation great. What they mean is patriotism, morality and spiritualism as they define those things. They are selective observers of both the Constitution and society. It represents intellectual dishonesty. Frederick Douglas said: "I have said that the Declaration of Independence is the ring-bolt to the chain of your nation's destiny. ... The principles contained in that instrument are saving principles. Stand by those principles, be true to them on all occasions, in all places, against all foes and at whatever cost." What to the American slave is your Fourth of July? I answer, a day that reveals to him, more than all other days in the year, the gross injustice and cruelty to which he is the constant victim. To him, your celebration is a sham; your boasted liberty, an unholy license; your national greatness, swelling vanity; your sounds of rejoicing are empty and heartless; your denunciations of tyrants, brass-fronted impudence; your shouts of liberty and equality, hollow mockery; your prayers and hymns, your sermons and thanksgivings, with all your religious parade and solemnity, are to him mere bombast, fraud, deception, impiety, and hypocrisy - a thin veil to cover up crimes which would disgrace a nation of savages. There is not a nation on the earth guilty of practices more shocking and bloody, than are the people of these United States, at this very hour. Let us never forget that slavery was underpinned by the Christian idea that Blacks were inferior to whites. That should caution that Benhams about declaring that LGBT citizens are inferior. They lack the curiosity to consider the implications of history. They lack the introspection to come to the conclusion that inequality is a cancer on American morality. This Fourth of July, we committed all the more to stand against the foes of our freedom "with a firm reliance on the protection of divine Providence ... pledging to each other our Lives, our Fortunes and our sacred Honor." No Mr. and Mr. Benham I shall not join you and most Americans shall not join you. Your idea of patriotism is one that is warped by the notion of Christian Supremacy which gives way to Christian Privilege. It is as un-American as ISIS.